Nociception is the sensory process that provides the signals that lead to pain. This occurs through nociceptors, primary sensory neurons that are activated by stimuli that cause tissue damage. Stimuli can include tissue injury, extremes of heat and noxious chemicals. Unlike other sensory neurons that detect vision or taste, nociceptors are located all around the body, particularly under the skin, however, they are notably absent from the brain. Damaging stimuli are detected and processed by nociceptors by various means, most commonly through ion channels. Tissue injury (i.e. a cut) leads to stretching or bending of the nociceptor membrane activating mechanically-gated ion channels. Extremes of heat activate heat-sensitive ion channels and certain noxious chemicals can also open ion channels. Upon channel opening, the nociceptor membrane becomes depolarized, reaching a threshold capable of achieving an action potential. Increases in Ca2+ may additionally lead to the release of neurotransmitters, mostly glutamate. Alternative to ion channels, signals may also be generated through the stimulation of intracellular second messenger systems. A signal is then sent down the neuron via the spinal cord and to the medulla of the brain where it is deciphered by the primary and secondary somatosensory cortex which determines the location and intensity of the stimulus. Emotional and automatic responses to pain are then processed in other areas of the brain, including the hypothalamus and amygdala. These will upregulate the feeling of pain and inflammatory response. Information from nociceptors takes a different path to the brain than that taken by mechanoreceptors, consequently eliciting a different sensory experience. When tissue damage induces pain, nociceptors can become even more sensitive to it after the initial onset: this is known as hyperalgesia. 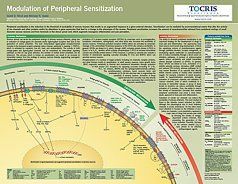 When substances such as histamine, serotonin and prostaglandin are released at the damaged site during the pain and inflammatory response their presence has an effect on nociceptor activity, enhancing its ability to send signals to the brain. Therefore to reduce the feeling of pain, a decrease of these substances is necessary. Drugs such as ibruprofen and aspirin work by inhibiting prostaglandin and lessening the overall pain experience. There are 2 main types of nociceptor: namely C-fibers and Aδ fibers. C-fibers are unmyelinated, whereas Aδ fibers are thinly myelinated and associated with a much faster conduction and response. Aδ fibers are mostly associated with first acute pain and the response to heat and weaker stimulus intensity. Strong stimulus intensity leads to a C-fiber response, which is associated with dull, longer-lasting pain. C-fibers are also considered to be polymodal as they react to chemical, thermal and mechanical stimuli and many physiological changes in the body, including hypoxia. Nociceptors also exhibit plasticity: their responses to stimuli can vary, particularly in the presence of inflammatory mediators. 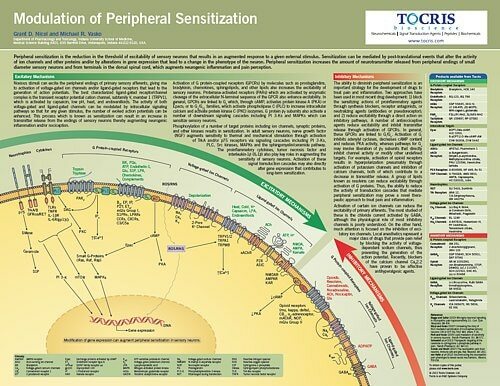 Tocris offers the following scientific literature for Nociception to showcase our products. We invite you to request* or download your copy today!